OS grid reference: SO 3030 3136. The medieval church of St Beuno and St Peter at Llanveynoe (Llanfeuno) stands in a remote hamlet along a narrow country lane 2 miles north of Longtown above the Olchon Valley, close to the Herefordshire/Monmouthshire border, at the edge of the Black Mountains. The town of Hay on Wye is 8 miles to the north. The little church houses two ancient stones with incised crosses and an inscription, while in the churchyard a curious thin cross can be seen. Cemented into the south wall of the church are two stones. One of these shows Christ crucified. 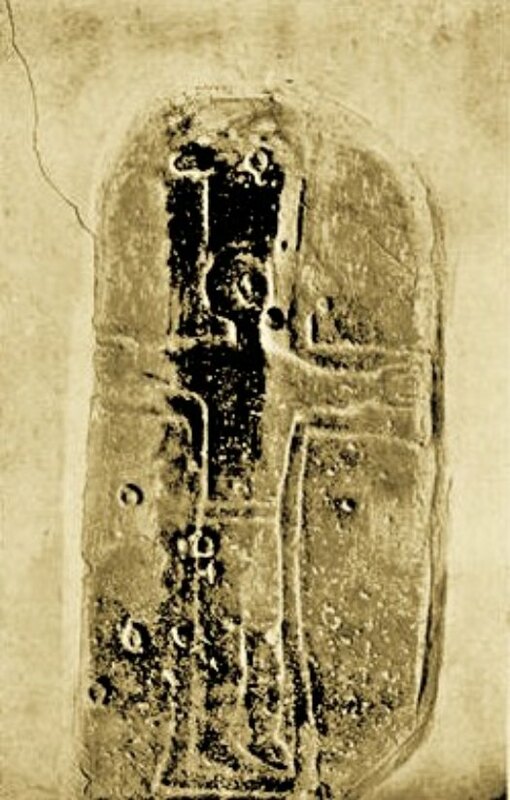 He wears a tunic and his arms are out-stretched with his feet in a standing position, head leaning slightly to one side. Tiny holes or pock marks can be seen in the stone, suggesting that it could be part of a pre-Christian, pagan altar? Next to it, another stone shows signs of damage. 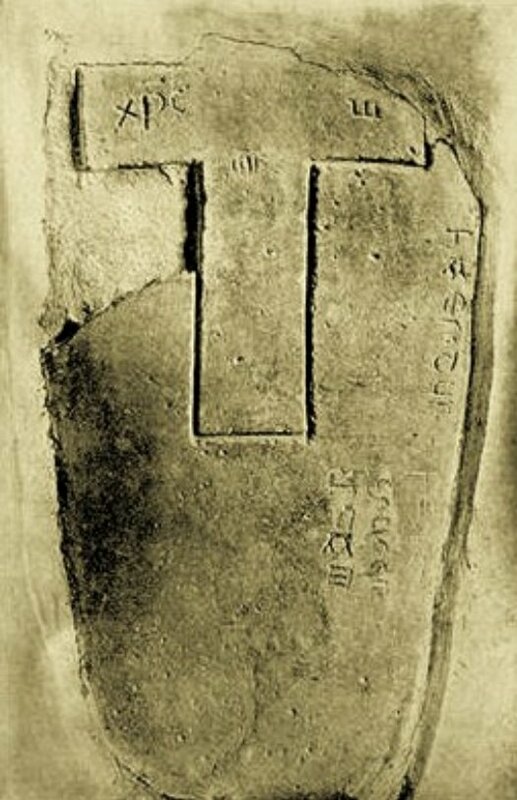 This has only half an incised cross, an incription, and alpha and omega symbols. Both stones are thought to date from between the 7th-10th centuries. The inscription is difficult to read because it is damaged and, also quite tiny Latin lettering. It reads:- HAES: DUR FECIT CRUCEM STAM and when translated is something like ‘Haestar made this cross’. At the top of the stone XPC the Greek Chi Rho and the letters IHC the Greek word for ‘Christ Jesus’. A fourth stone with a carved cross was found in the wall of a barn half a mile further along the Olchon Valley; this is now built into the church’s north wall, while a fifth stone with an inscription was discovered in the valley back in the 1870s but was badly broken during the construction of a road. This stone, or what’s left of it, is now in the south wall. Outside in the churchyard among the more recent gravestones stands a 5 foot high thin, short-armed Celtic-style cross. This has a channel running down it’s shaft. It seems to have been used in recent times for a water channel. This was found in the 1870s and brought to the churchyard for safety. The date is probably 10th century? St Beuno came to Llanveynoe in 600 AD and founded a small monastery on what was a pagan site. This was either situated where the church now stands, or on the site of Olchon Court, close by. Indeed, recent archaeological excavations in the grounds of the court have found what could be the foundations of a monastic building. Beuno was born in 560 AD at Berriew in mid-Wales, but his education was at Caerwent in south Wales under St Tangus (Tatheus). He was the nephew of that great Welsh saint, Cadoc, and his grandfather was non other than King Brychan of Brecknock (Brecon). After a few years stay at Llanveyno, Beuno headed north back to Berriew where he attended and ministered at his father’s funeral. From there he travelled north to the district of Tegengle and what is now Holywell, Flintshire, where his neice St Winifred was living. His most famous monastery was at Clynnog Fawr on the Lleyn Peninsula, but he established another 10 churches in north Wales. St Beuno died at Clynnog Fawr in 640 or 642 AD. Categories: Ancient Churches / Chapels, Llanveynoe | Tags: St Beuno, St Beuno's Church at Llanveyno in Herefordshire | Permalink.